As home security technology advances, the methods that criminals have started using have become increasingly creative. Kim Fleming Cernigllaro, a mom from Texas, had a close encounter with one of these burglars. After being home alone, she heard this loud and urgent banging on her door. It sounded similar to someone who might be in distress, but as much as she wanted to help, Kim had a rule that she never opens the door for people she does not know. In this case, however, she was lucky that she continued letting the stranger knock until he walked away. Around 30 minutes after the knocking incident, Kim stepped outside to investigate if anything had been left behind to identify who the stranger had been. Instead, she found a rubber band that had been wrapped over the door handle, and it pressed down the latch. When Kim called her husband on the phone, he told her to grab the family gun and call the police so that they could continue with the investigation. Kim later spoke further about the incident on Facebook where she said that the Sheriff had visited her residence, and he told her that this event has become more commonplace. Many home invaders have started to use this technique so that as soon as you unlatch the door, they will break in. The rubber band acts as a wedge that keeps the door open. You do not even have to open the door for it to happen. As soon as you have unlatched it, intruders can knock you over and steal all your belongings. Anyone who has fears of home security should avoid leaving old newspapers or mail lying outside their house. Also, avoid making the bed every morning, and if you cannot afford a home security system, you can also light up your house to keep the burglars guessing about where your valuables might be. Small actions can keep a burglar from trying to get into your home. Criminals are often searching for the easiest target because they do not want to get caught in the process. In particular, be on the lookout if you have a door knob that can be rubber banded in the same way that happened to Kim. Had she opened that door, the burglar could have burst through, and she would have been the victim of a home burglary. The rubber trick is good for everyone to be aware of, and you want to share it because you could save someone from becoming a victim. If something doesn't feel right, remember to exercise caution. You do not want to be overly trusting of people. In many cases, the best route is to call the police if you find suspicious activity near your home. It could save someone's life. 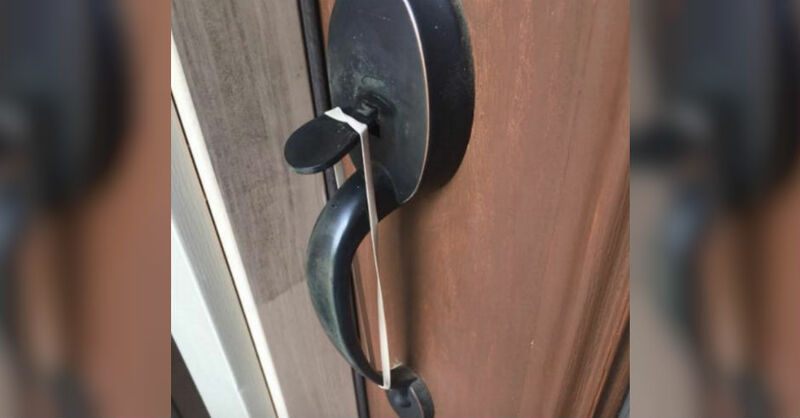 Also, if you ever spot a rubber band over a door handle in this way on someone else's door, the best option is to call the police immediately. They might not be aware of what is going on, or there could be a burglary happening at that moment.